ColonialWebb, one of the largest installers of mechanical systems in our region, was hired to add new HVAC systems to the freshman dormatories, often referred to as the "Old Dorms," at the University of Virginia. Successful installation of the new systems was dependent on accurate as-built documents that delineated the space available for new ductwork, piping and air handling units. 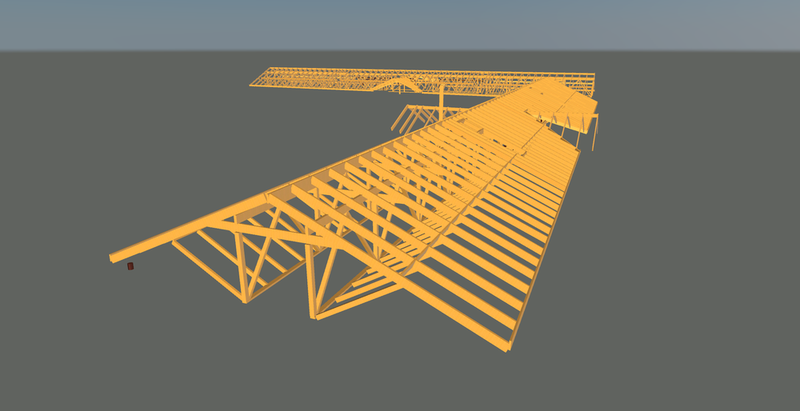 ColonialWebb engaged Prologue Systems to scan 70,000 square feet of dorm attic space and deliver 3D architectural models of the rafters and other structural features. The contractor had drawings for the attics, but spot checking and anecdotal hand measurements raised some concerns about the accuracy of the existing plans. Furthermore, existing framing systems and low ceilings resulted in space being extremely limited. Any deviations from the final permit drawings would have required expensive and timely rework. Prologue collected millions of accurate measurements in the tightly confined spaces of the attic dorms built in 1950. These measurements accurately depicted the layout of the attics and were used to generate 3D models. Based on the 3D models created by Prologue, ColonialWebb has a comprehensive understanding of the attic layouts so they can install new HVAC systems efficiently. The client received accurate, as-built, models in a reasonable time for a reasonable fee. With the 3D models created by Prologue, ColonialWebb has a comprehensive understanding of the attic layouts and can install new HVAC systems efficiently and without conflict, thus saving money on fees. Prologue also assisted the contractor with coordinating AutoCAD drawings, Revit models and Navisworks visualizations.